Chunky yarns are so much fun to work with. I recently was given a few different colors of Bernat Blanket yarn, a yarn that I had not had the pleasure of using yet and was dying to get my hands on. I had to give it some thought before I could decide what to do with it — you know it has to be just perfect. 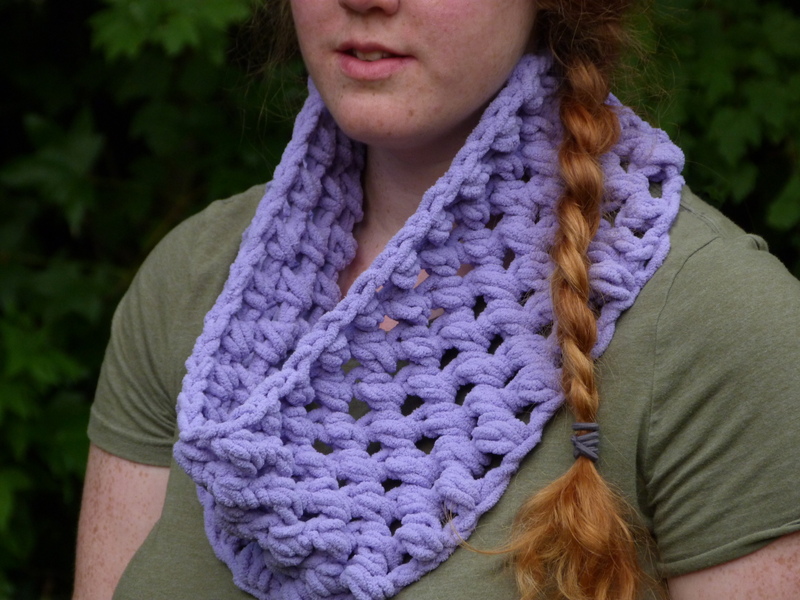 I chose to design a simple cowl and let this lovely lilac yarn be the main feature. Though it is still blazing summer here, I imagine I am hastening fall by designing a chunky cowl. Want to give it a try? The cowl is very easy to make. Puffs are essentially a cluster of hdc, and you can have as many hdc in one cluster as you can manage. However, since the yarn is so bulky, a 2 hdc puff is adequate for this project. Gauge Swatch: 3’’w x 3’’h (7.5 cm x 7.5 cm) ch 7. Leave me a comment below if you have any questions or thoughts! This entry was posted on Monday, August 6th, 2018 at 10:20 AM by Amy	and is filed under Free Crochet Patterns. You can follow any responses to this entry through the RSS 2.0 feed. You can skip to the end and leave a response. Pinging is currently not allowed. have made your cowl, in the party simply soft yarn,the people have been so pleased with it.wouldn’t think that this simple look would be such a hit….thanks so much. My pleasure, Brooke! Glad to hear it!